RLJE Films has acquired all North American rights to the upcoming horror film All the Creatures Were Stirring. Written and directed by David Ian McKendry (The Dump) and Rebekah McKendry (The Barista), known for their amazing work at Fangoria and Blumhouse, the film stars Constance Wu (Crazy Rich Asians, “Fresh Off the Boat”), Amanda Fuller (“Orange is the New Black”), Jonathan Kite (“2 Broke Girls”), Jocelin Donahue (Insidious: Chapter 2) and Graham Skipper (The Mind’s Eye). RLJE plans to release the film on VOD, Digital and DVD on December 4, 2018. In All the Creatures Were Stirring, an awkward date on Christmas Eve leads a couple into a strange theater, where they’re treated to a bizarre and frightening collection of Christmas stories, featuring a wide ensemble of characters doing their best to avoid the horrors of the holidays. From boring office parties and last-minute shopping, to vengeful stalkers and immortal demons, there’s plenty out there to fear this holiday season. 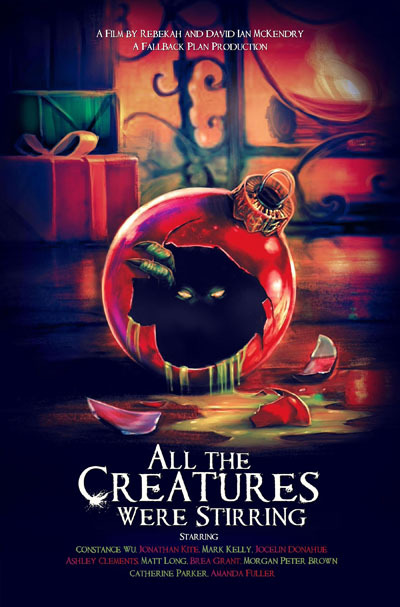 All the Creatures Were Stirring was produced by Morgan Peter Brown and Joe Wicker of FallBack Plan Productions (Absentia) and was executive produced by Kevin Kale.